Dave Grohl paid tribute on the Pyramid Stage to a Devon teacher who died of cancer. Foo Fighters dedicated the classic song Everlong at Glastonbury 2017 to a late fan, Laura Plane, who sadly lost her long battle with cancer. Following her sad passing in May, her widower Jon Plane contacted Dave Grohl through Twitter to ask if the band could perform the track in her memory at this year's festival. Jon and Laura - who lost her eight-year battle with cancer this year - chose the track as their first dance at their wedding and were due to watch Foo Fighters to celebrate their 10-year anniversary, but had to cancel as she was too ill.
Jon's request was picked up on social media and was retweeted more than 12 million times, leading to the frontman penning a handwritten note to Jon, which he shared via a photo uploaded to Twitter. The 48-year-old rocker wrote: "Jon - Dave here. Heard about Laura. Sending you much love and hope and light. Will be thinking of you at Glasto. Take care mate." And Big Dave was true to his word: before bringing the set to a climax, he said that the next song was for "Laura... who couldn't be here tonight." The band then launched into an emotional version of the 1997 classic, taken from their second album The Colour And The Shape. Speaking to The Plymouth Evening Herald newspaper, last week, Jon said: "I can picture Laura's little face smiling about it. It is incredible. I am over the moon. "Laura must have engineered this somehow as I was having a really bad week after her funeral when it hit me like a wave. I was a mess all of Sunday and Monday and then I saw Dave's message on Tuesday. I was blown away. The power of social media is crazy but incredible." After Laura was diagnosed with cancer, she raised more than £70,000 for CoppaFeel - a charity dedicated to breast cancer awareness. 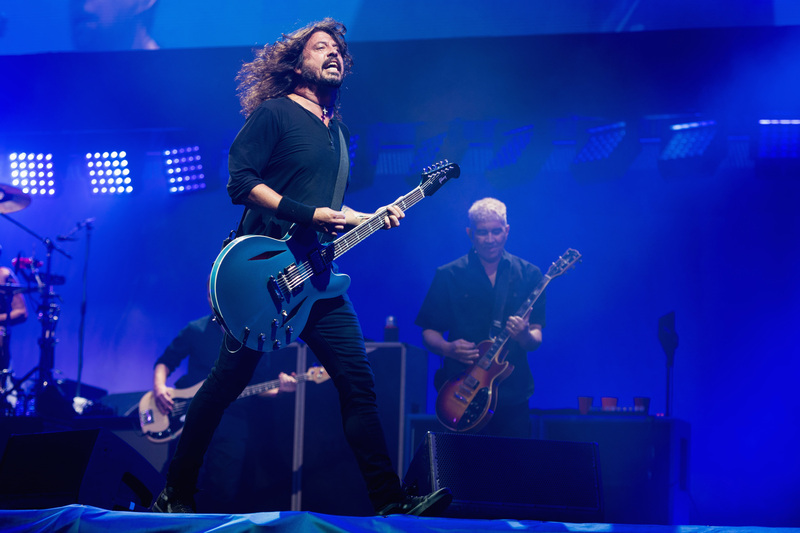 Foo Fighters headlined Glastonbury festival on Saturday 24 June, and a curfew wasn''t an issue. That wasn't the case at BottleRock festival in the US last month, though, where the plug was pulled on on the band halfway through the same song - Everlong.